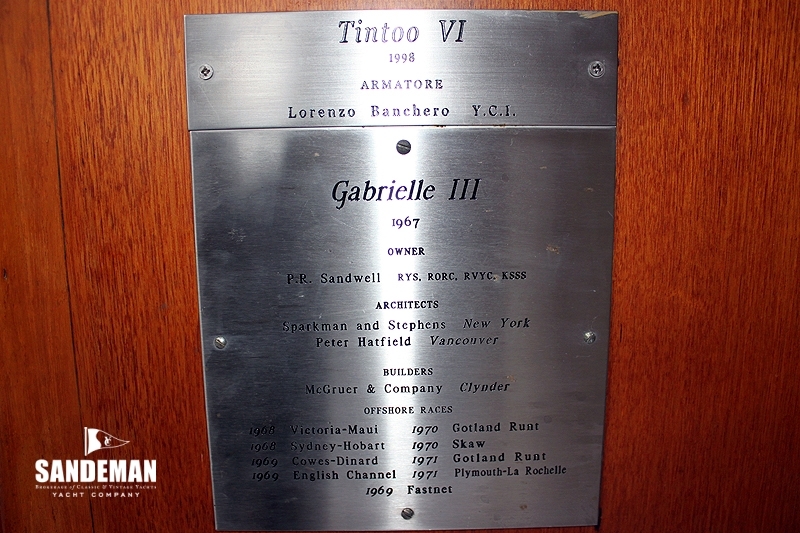 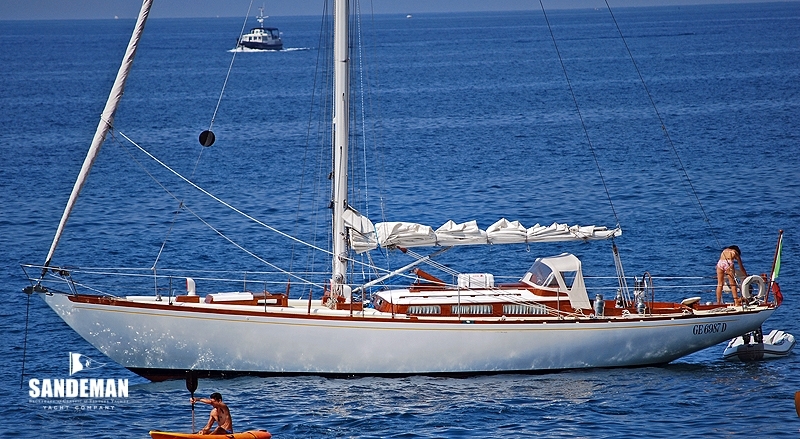 TINTOO VI formerly GABRIELLE III has had only two owners – her first was for 30 years and her second – in all honesty – are not sure they can bring themselves to replace her. 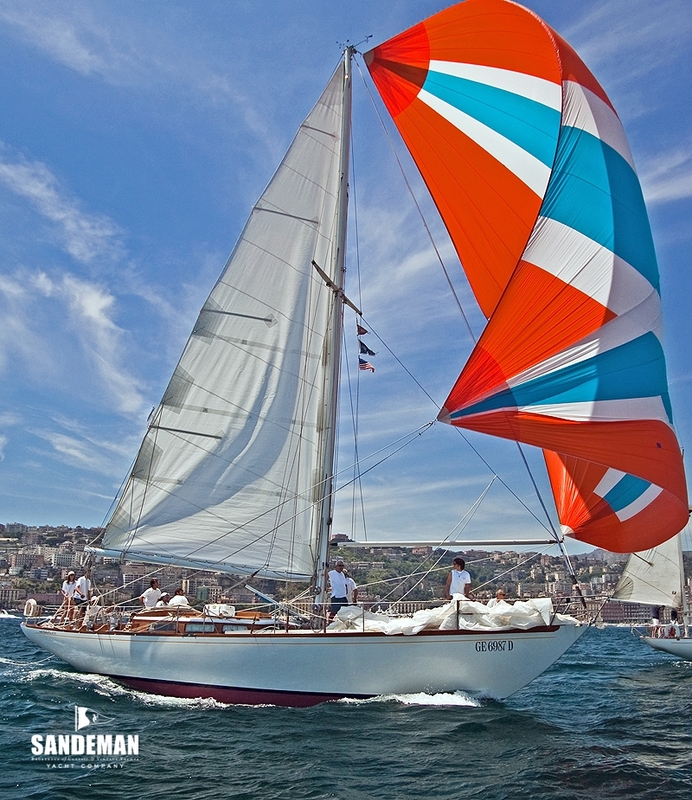 Her well proven Sparkman and Stephens pedigree speaks volumes but it is her ease of handling and sure footedness that seem to impress so as to make her hard to part with. 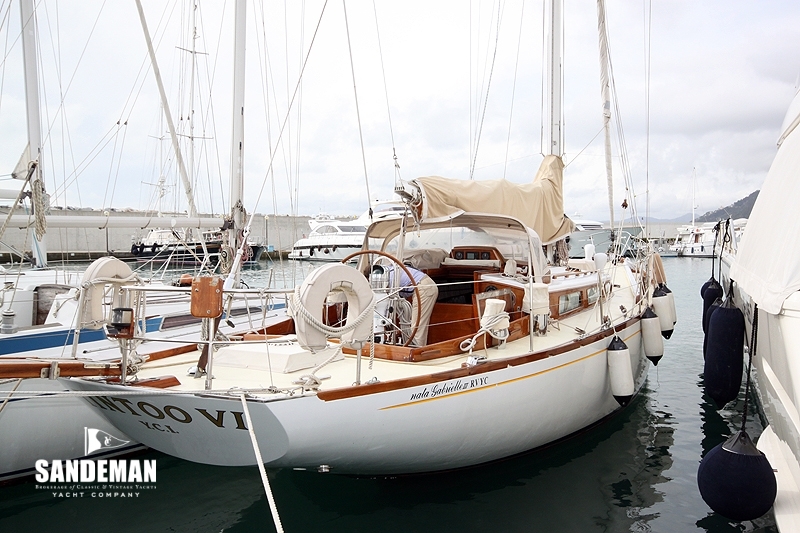 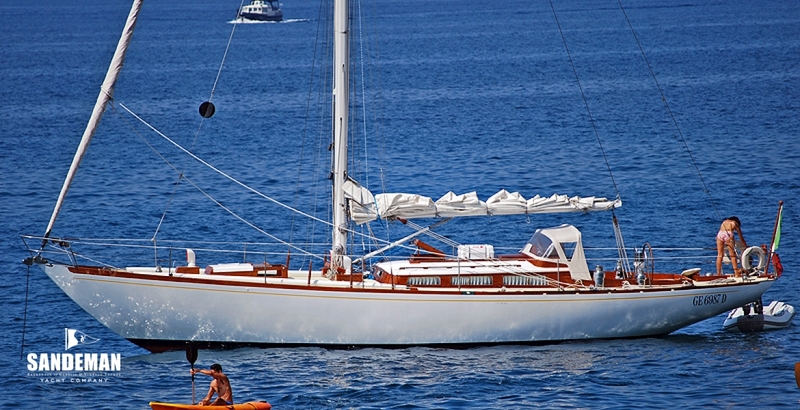 Her abilities – She can be sailed by only two or raced with a full crew complement - have been rewarded with loving attention and she has been skipper maintained since 1997. 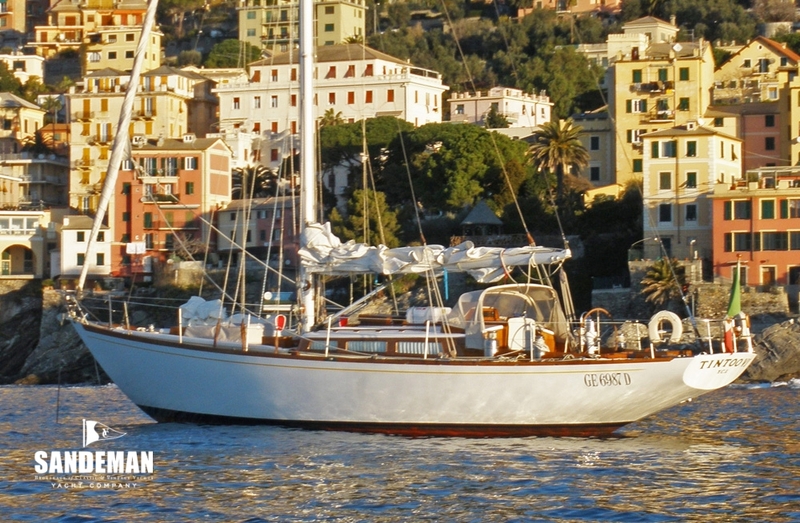 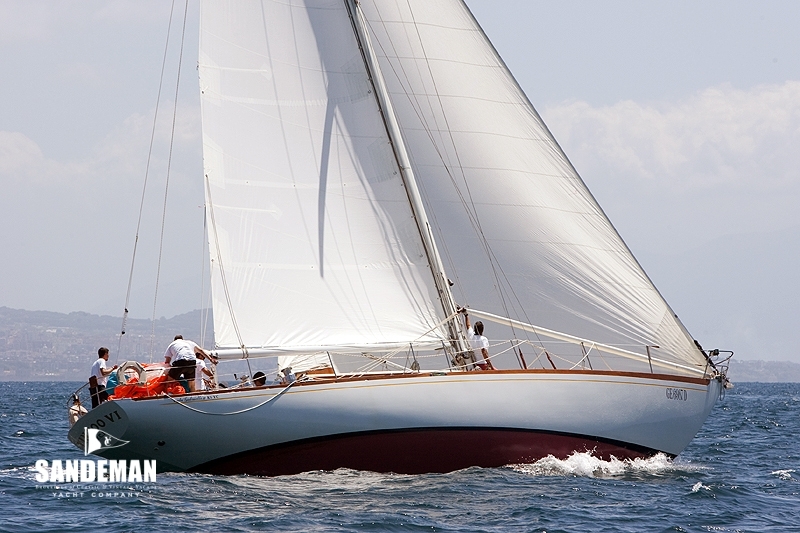 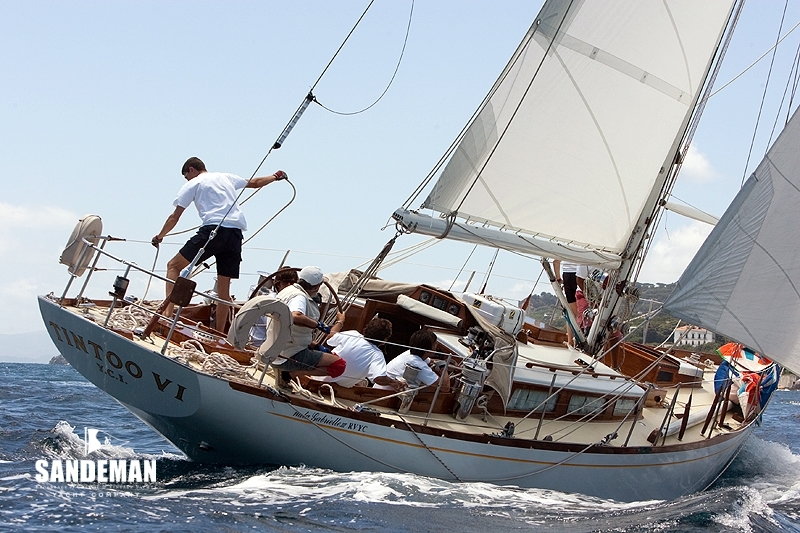 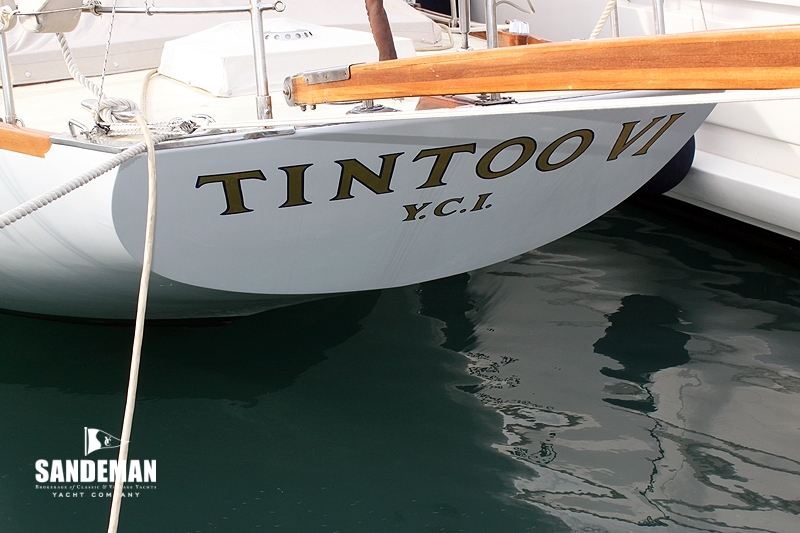 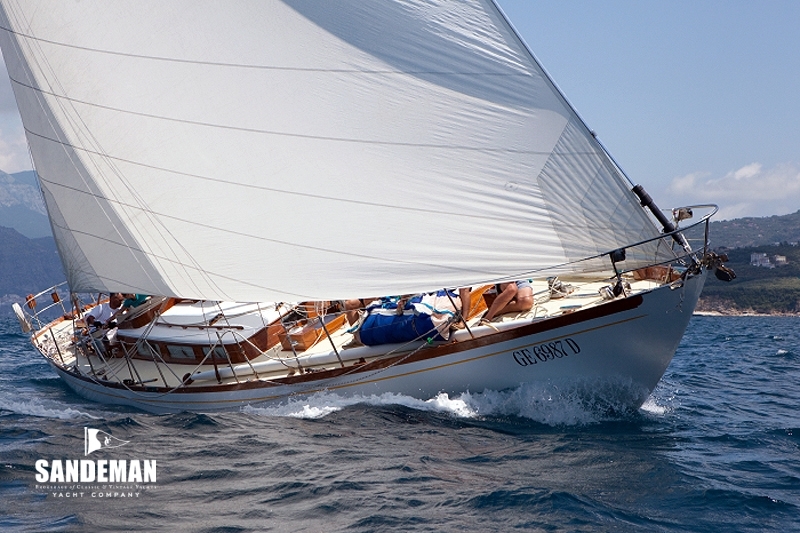 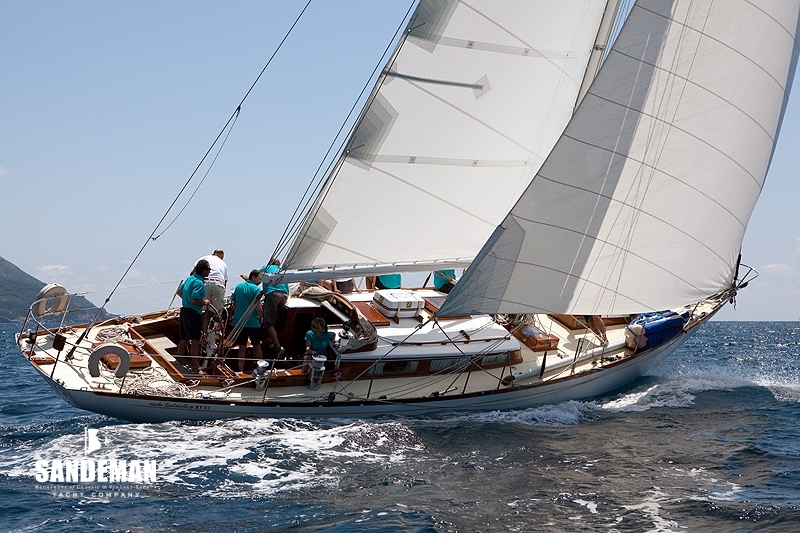 In recent years she has joined the sweeping sheer lines and long overhangs redolent of the classic Mediterranean veterans, however TINTOO is more rugged and with a blue water performance that many of the classic fleet simply could not match. 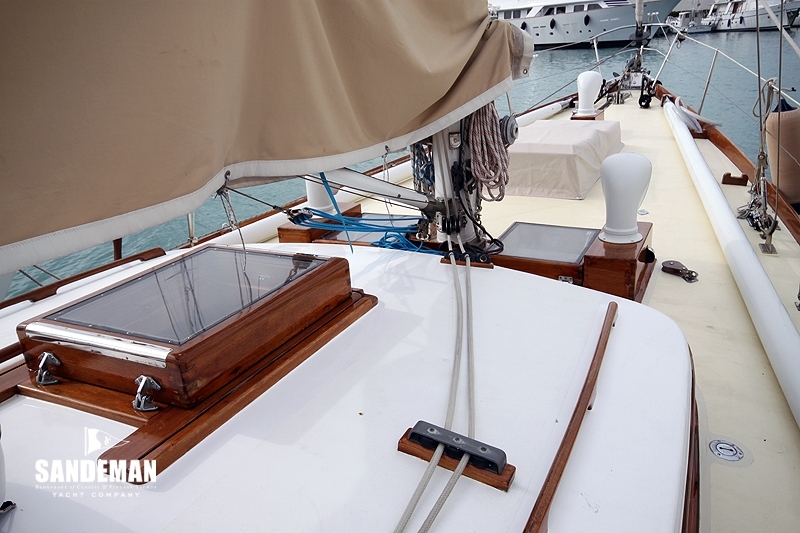 Planking above and below the waterline is Khaya mahogany. 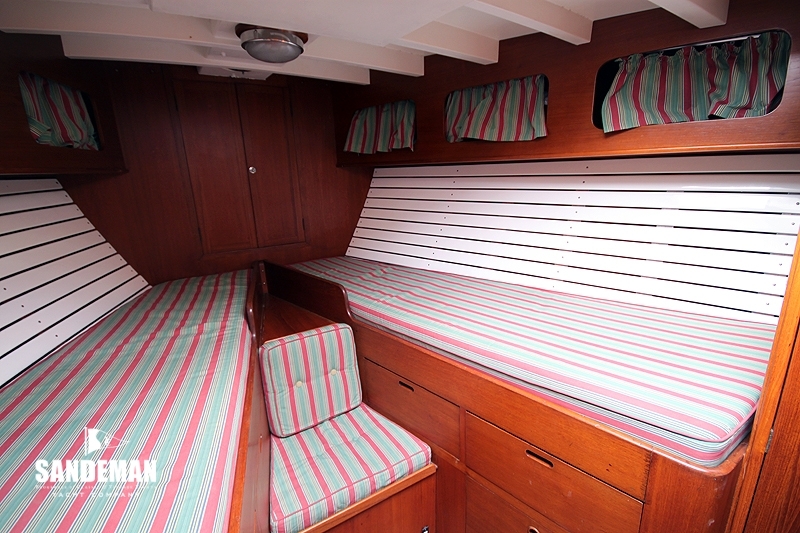 Fastening materials and frames are of Iroko. 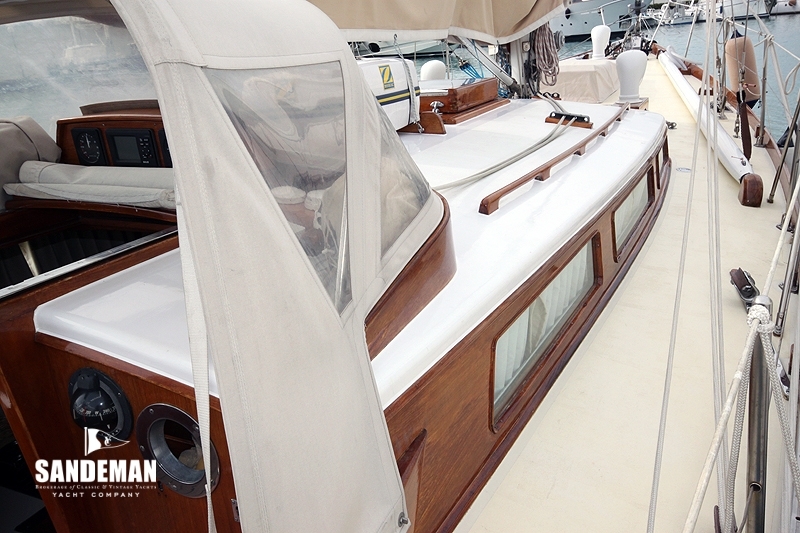 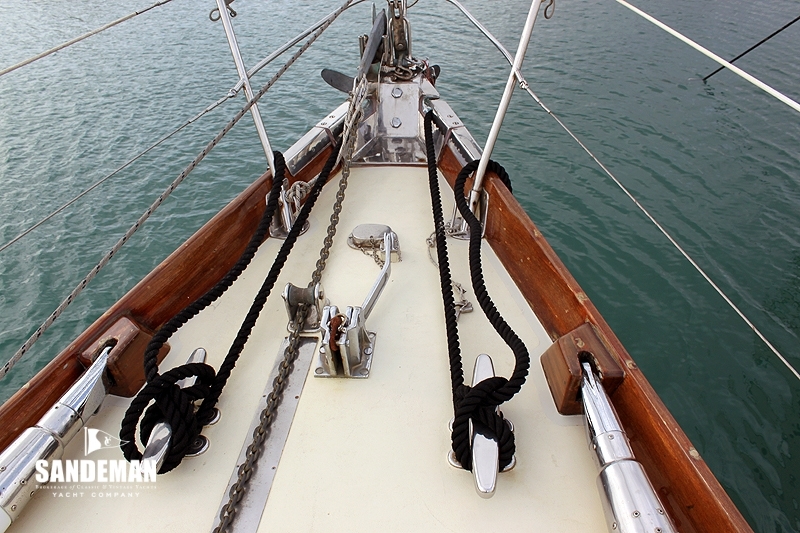 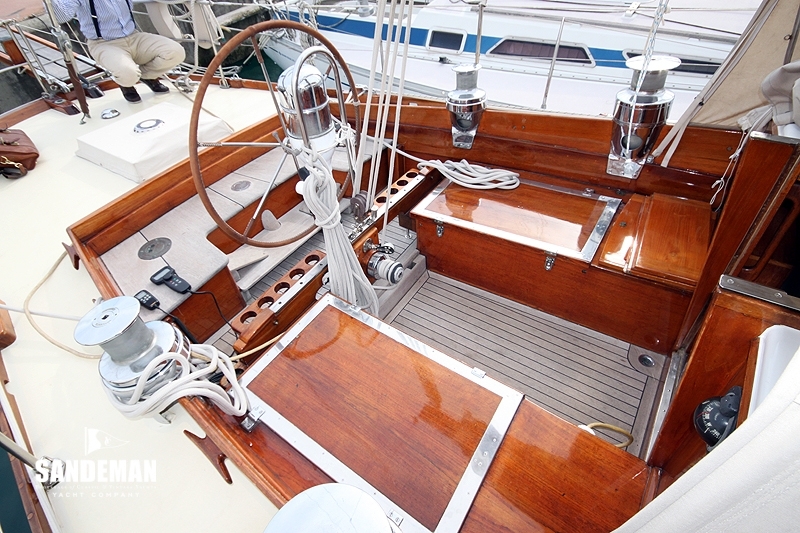 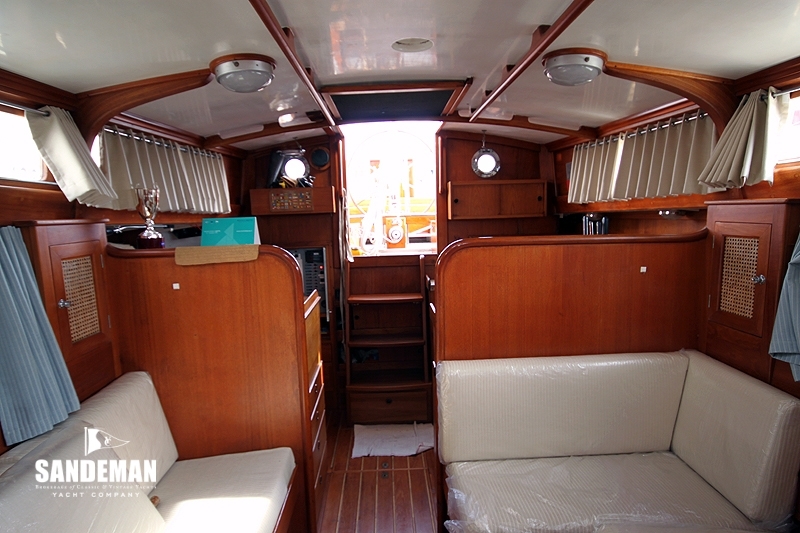 The floors and superstructure are of teak. 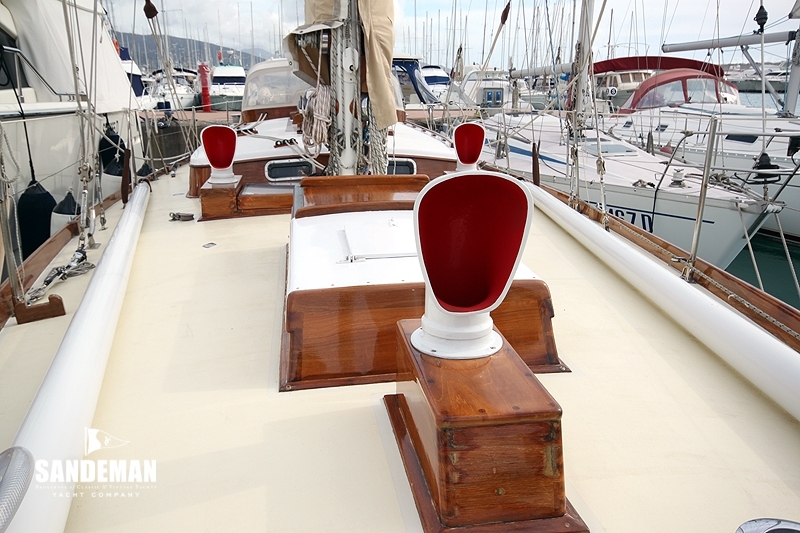 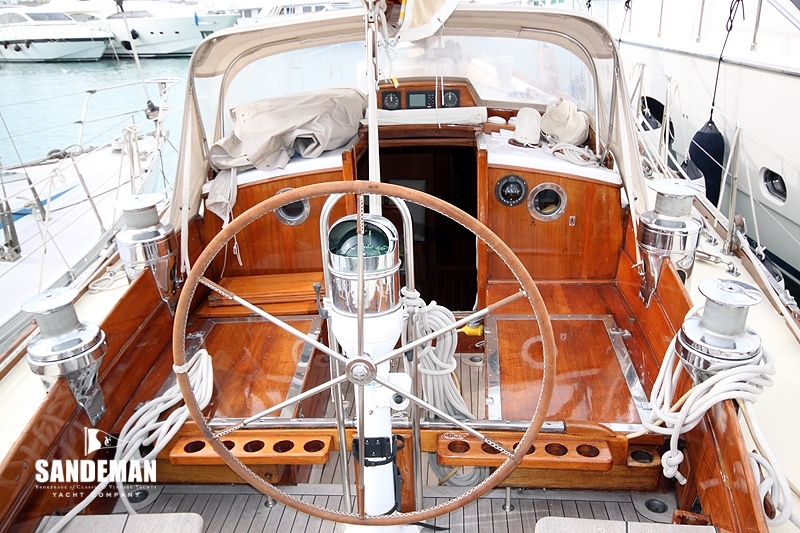 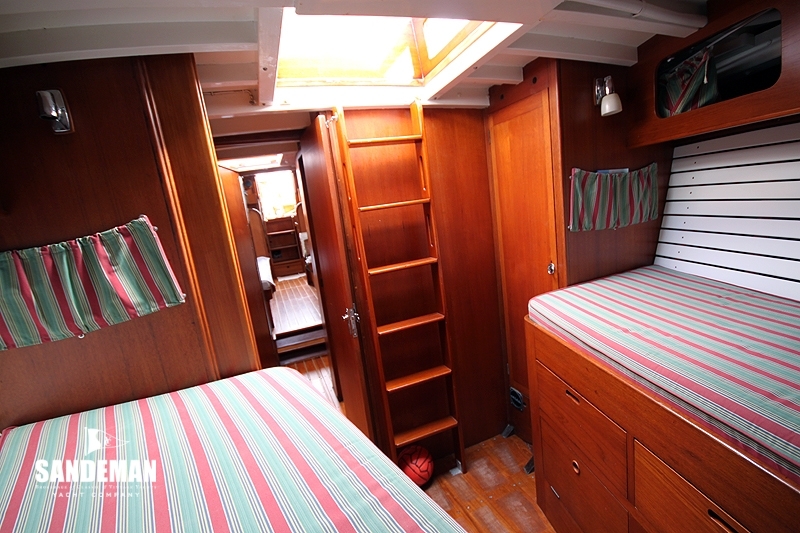 The Interiors are planked with white painted or varnished mahogany. 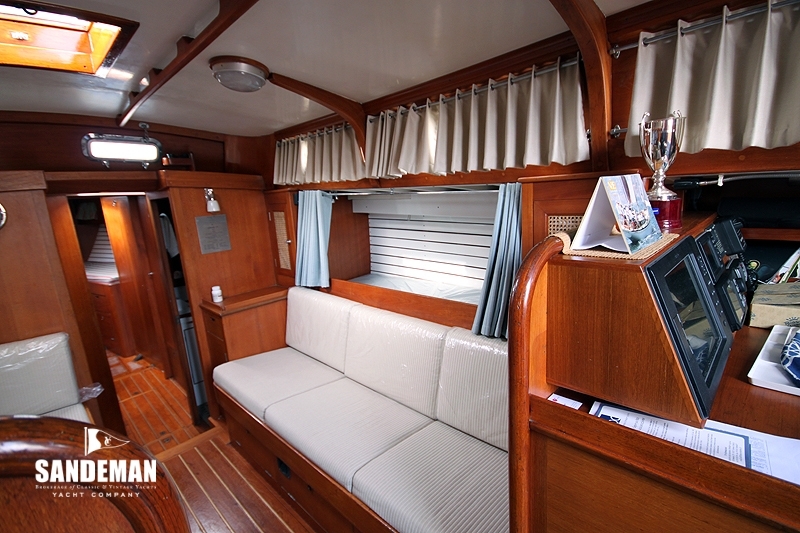 The interior furniture is teak. 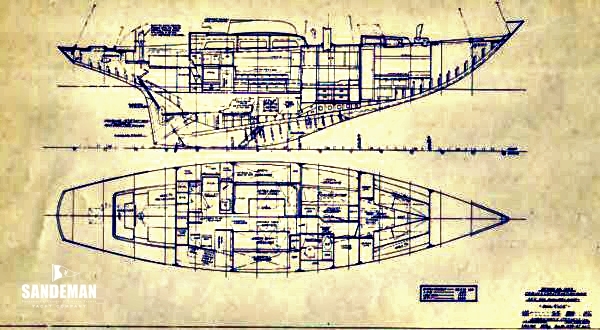 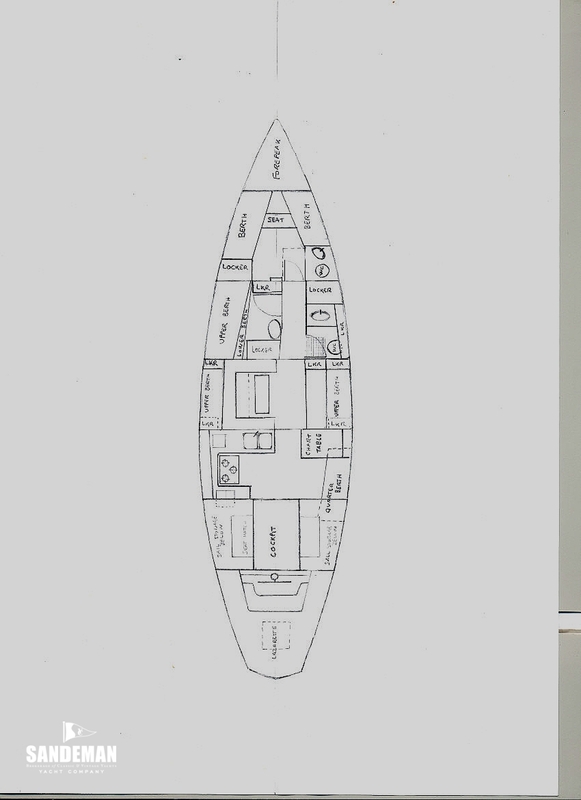 From the cockpit with ample lazarette aft and seats over hatches to the sail lockers each side, a sliding hatch and companionway steps amidships lead to the main accommodation below. 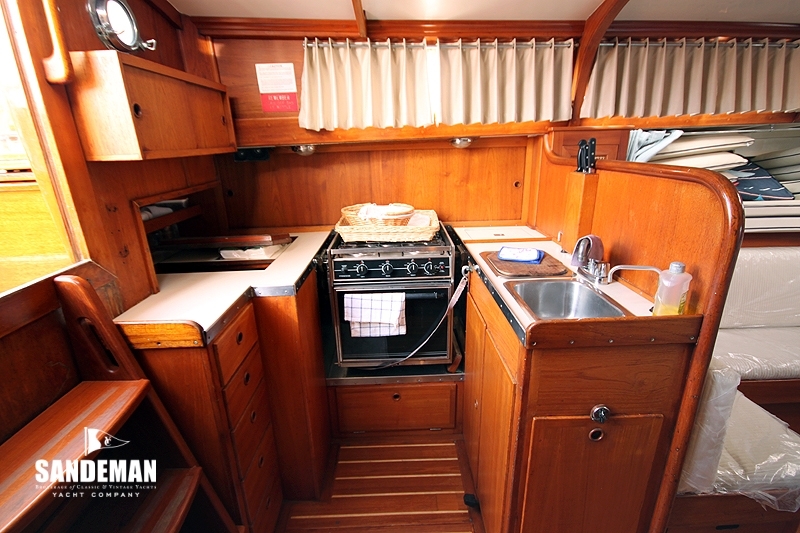 Immediately to port is the galley with 3 burner propane hob with Techimpex new in 2017,oven, water heater providing hot & cold pressure water, refrigerator (12V & 220V), double stainless sink. 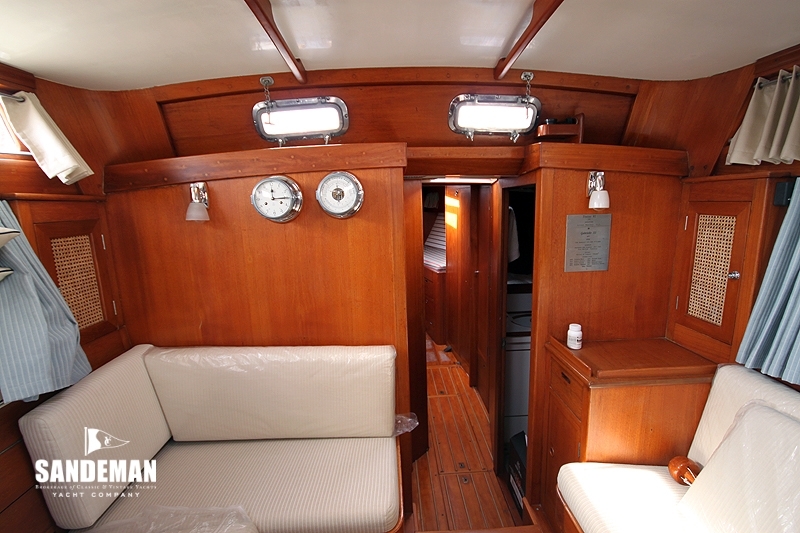 A half bulkhead gives way to the main saloon, which dressed in varnished teak with white soft furnishings and white deck head, well lit by curtained ports and deckhead lights gives a light and airy ambience. 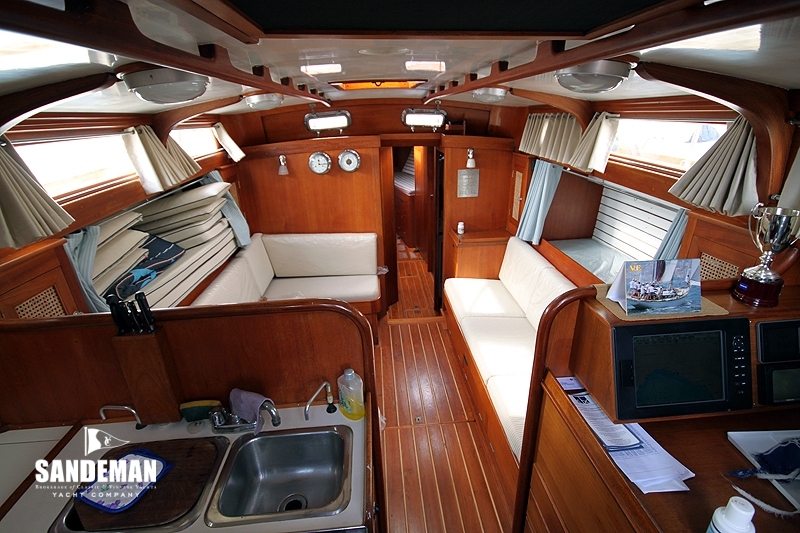 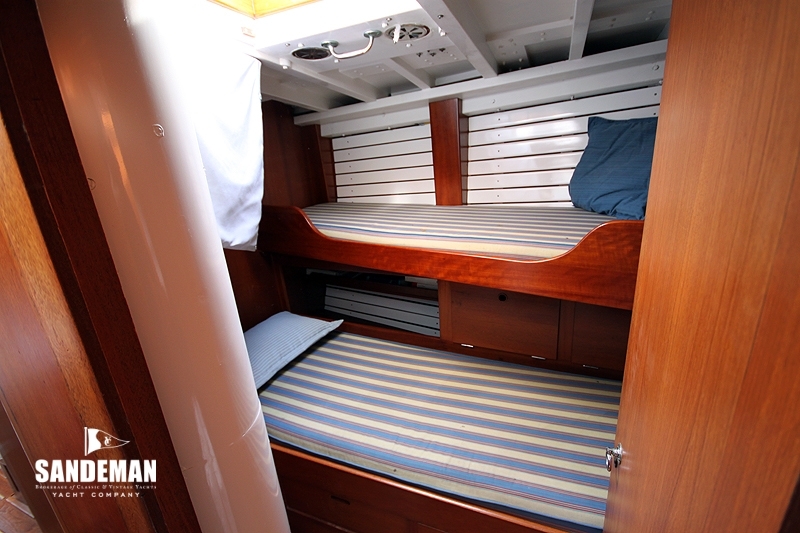 The U shaped settee, half surrounding the demountable table to port has a further single berth above and outboard. 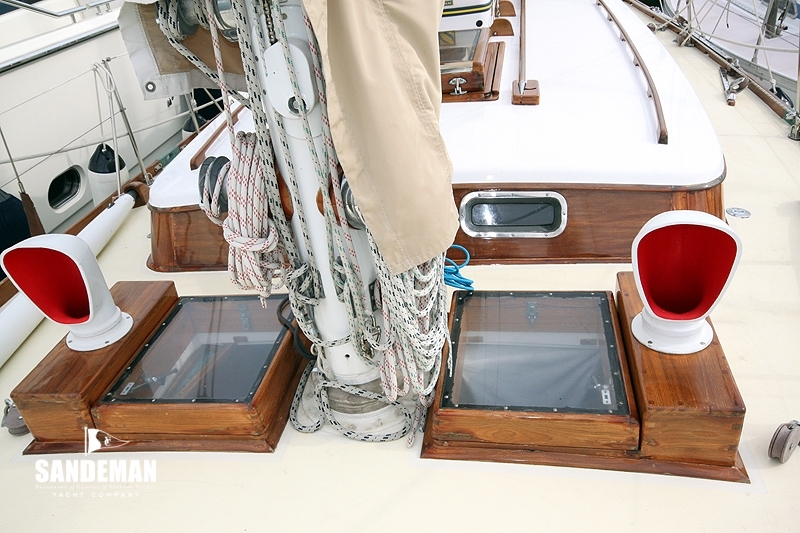 Ventilation is by through draft as well as a Dorade vent and box over the coach roof. 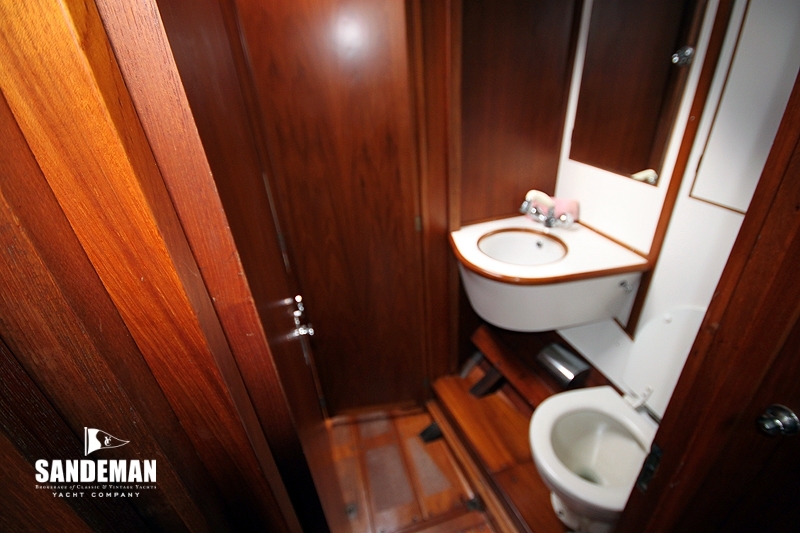 A doorway offset a bit to starboard through the full height bulkhead leads to the guest cabin with twin upper and lower berths, locker space and wash basin to port. 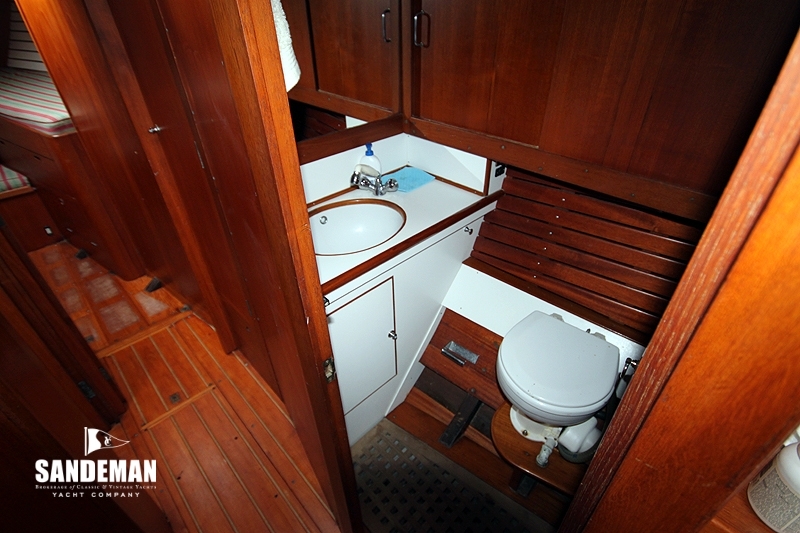 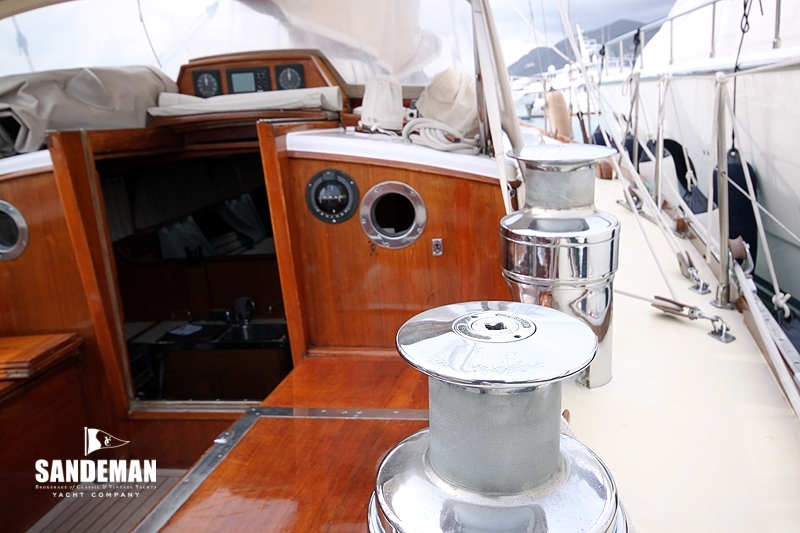 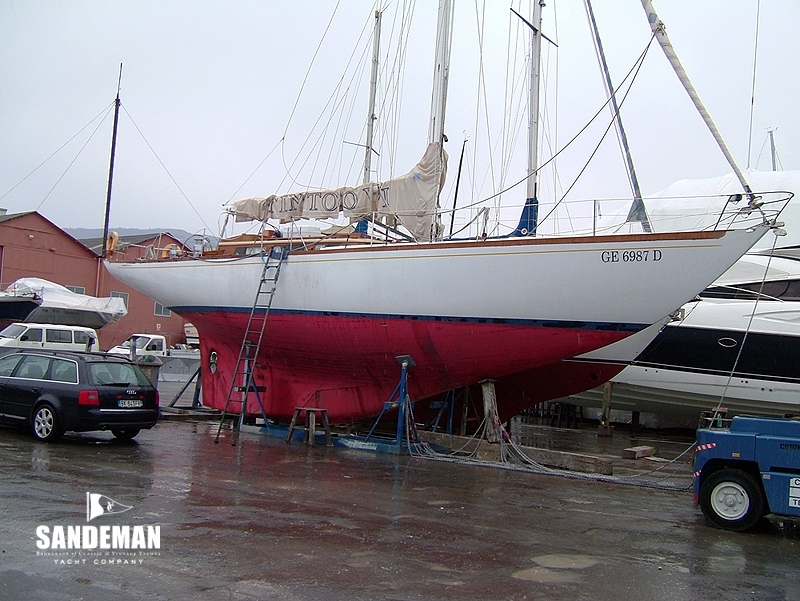 The companionway also with ladder access up to the fore hatch leads to the twin berth owners forecabin with en suite head and wash basin again with ample stowage. 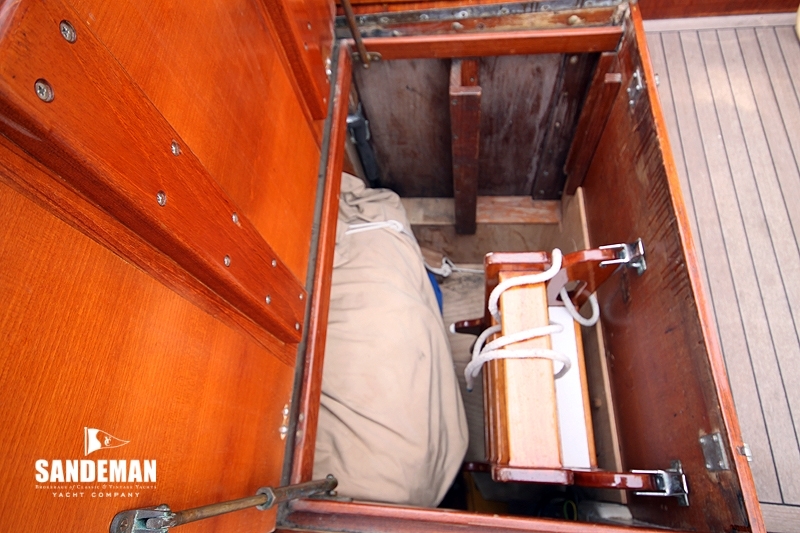 Moving back past another hanging locker on the starboard side is the main head and wash basin for the guest cabin before re entering the saloon with single berths above and below abutting the chart table and navigation station aft – opposite the galley. 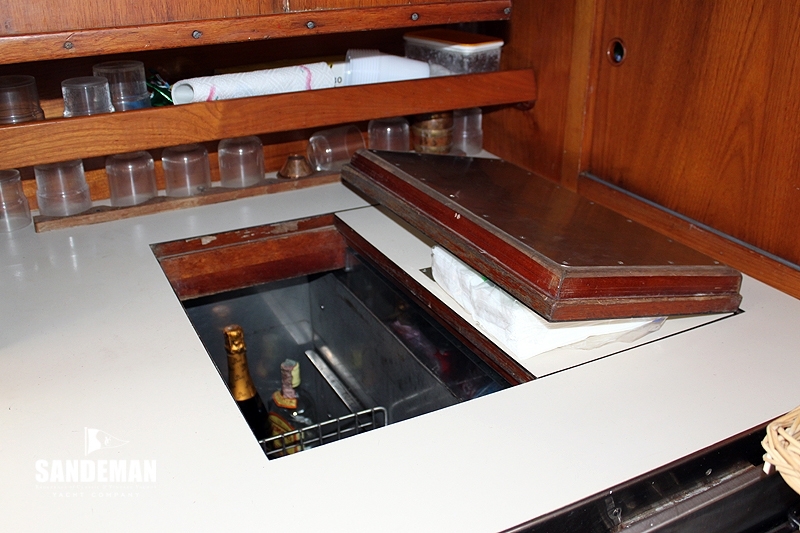 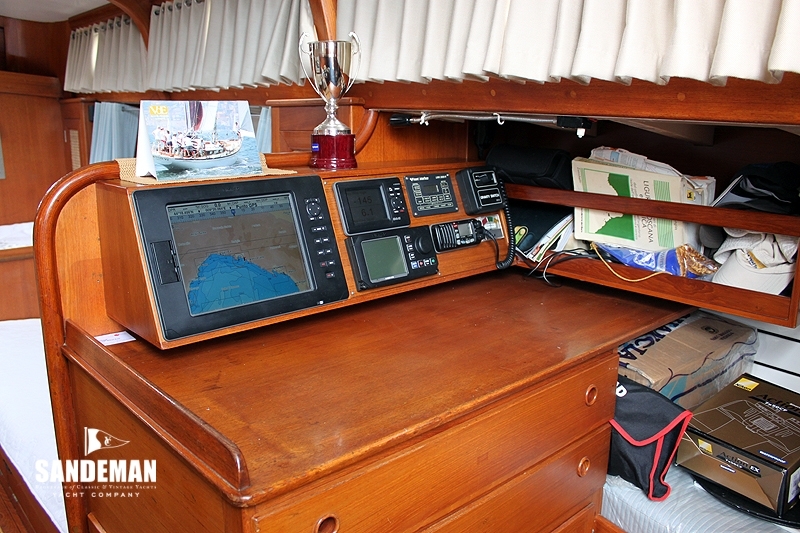 The quarter pilot berth is accessible abaft the table. 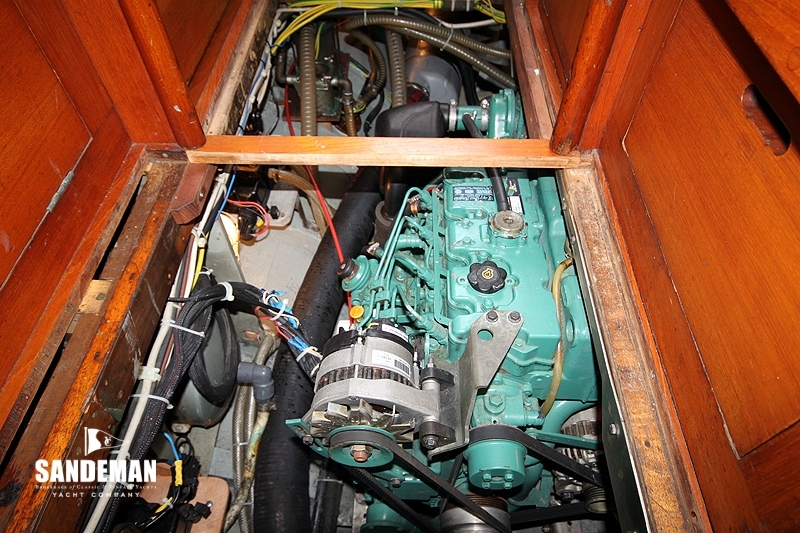 - Volvo Penta D2 -75 HP engine new Nov 2004.